Mark your calendars: Sparta Ski Swap December 1, 2018 Sparta NJ. Consignment drop off is evening of Nov 30th. Specs: Summit elevation: 720′; Base elevation: 450′. 4 Lifts: 2 doubles, 2 surface lifts. Uphill Capacity: 1800/hr. Terrain Mix: 50-38-12. Longest Run: 600′. Season: usually December through mid March. Night Skiing. Annual Snowfall: 45″. Snowmaking: 100%. The SKInny: Built by the Army Corps of Engineers, operated by the Bergen County Recreation Division, providing a great learning hill for over 40 years…hard to believe it’s still operating, in New Jersey no less. Campgaw is about 20 miles from Manhattan. This is a great little ski hill, crowded at times, but ideal for beginners of all ages. Home to a lot of after-school skiers who grow up to slash Hunter West or crank the hits at Mountain Creek South. Campgaw offers both a very good ski experience and a view of the George Washington Bridge. Hidden Valley, Vernon • 36 skiable acres on 620′ vertical See National Winter Activity Center, below. Specs: Summit elevation: 1480′; base elevation: 440′. Actual vertical is probably 1001′ on 1452′ summit and 451′ base. 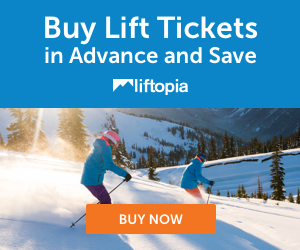 10 Lifts: 1 open standing gondola, 4 quads, 1 triple, 3 magic carpets, 1 rope tow. Uphill Capacity: 15000/hr. Terrain Mix: 30-37-33. Longest Run: 9300′ as measured by skiernet.com. Season: usually mid December through late March. Night Skiing. Annual Snowfall: 65″. Snowmaking: 100%.. 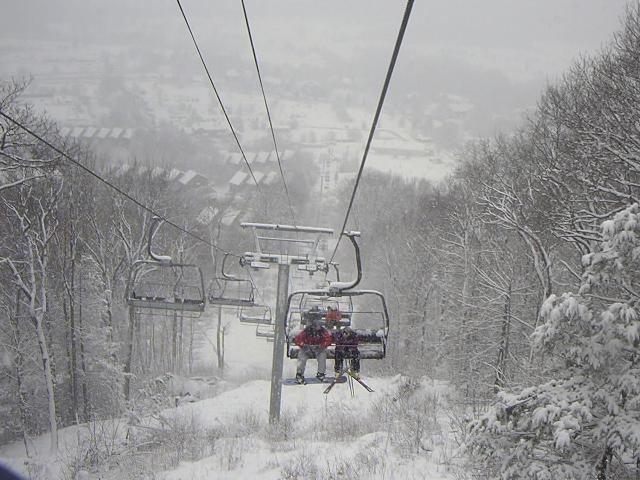 The SKInny: When all is said and done, Mountain Creek is a world-class ski area in New Jersey. Wanderers can choose among four separate summits spread across 3.7 miles of terrain, and will be in heaven. Hotshots will find a couple of very short but taxing sections on some trails. Trails on the weekends can be a nightmare, but you can generally find open runs and short lines on Granite Peak (the old Great Gorge North). On some weekends you won’t find short lines anywhere. Best skiing was at South. In recent years Vernon Peak has been crowded, and the atmosphere has been heavy with in-your-face youth attitude. A massive hotel was constructed a couple years ago but is embarrassingly underused; a painful lesson to ski area operators that customers like to have a lodge as a prerequisite to lodging. It didn’t help that patrons would rent a room, then step on a lift crowded with foul-mouthed, chain-smoking teenage snowboarders acting like wannabe “gangstas.” So in 2007, management converted the entire South section to the park’n’pipe theme, supposedly because it was underused. I still say they were hoping to draw the uncouth away from their hotel. A lot of skiers fled the all-park “South” for the less edgy atmosphere of Vernon Peak. Parking at Vernon is deplorable — possibly the longest walk in the east without a shuttle — and the lift requires you to take skis off and stand, all for a trail system that funnels down to a single runout. Recently skiers were treated to a brand new and rather delightful lodge at Vernon Peak, replacing the ghastly bubbles. Time will tell if the parking in Vernon will ever improve, or if the Opossum trail will reopen and alleviate some of the traffic at the funnel. One thing remains certain: The ski resort on Hamburg Mountain is quintessential Jersey. Would we really want it any other way? National Winter Activity Center Vernon • 36 skiable acres on 620′ vertical. NOT A PUBLIC AREA. Specs: Summit elevation: 1435′; base elevation: 815′. Approximate Terrain Mix: 10-40-50. Longest Run: 4124′ Season: December through late March/early April. Night Skiing. Annual Snowfall: 65″. Snowmaking: 100%. The SKInny: Formerly Hidden Valley Ski Area, which was established in the late 1970s. Now operates as a “facility focused on improving lives through winter sports.” Main focus is underprivileged kids in the New York metro area, with an emphasis on racing programs. Pretty cool. Not open to the public, but cool just the same. Craigmeur, Newfoundland NJ A classic feeder hill where thousands upon thousands from the New York metro area learned how to ski. From J-bars to jumps, Craigmeur had it all. Skiing at Craigmeur closed in 1998, but fortunately NJ Ski Historian Liz Holste has preserved it here! Great Gorge, McAfee Now part of the Mountain Creek complex, previously purchased by Great American Recreation and merged with Vernon Valley. This page covers the era up to the merger. Snow Bowl, Milton Closed in the mid 1970s, this Morris County ski area can still be visited — and skied — today. Vernon Valley, Vernon Now part of the Mountain Creek complex, previously operated by Great American Recreation and merged with Great Gorge. This page covers the era up to the merger. It’s the notice an employee dreads: You’ve been transferred to New Jersey. Bad as it sounds, as a skier you could do a lot worse. A LOT worse. Most of the Garden State is within an hour or two of decent skiing in Pennsylvania, not to mention the fully developed Mountain Creek resort described above. You’ll also be within a couple hours of the Catskill areas in New York; Belleayre, Plattekill, Windham, and Hunter. Weekend trips to Vermont are de rigueur for Jerseyites, and Newark has multiple daily flights to Denver and Salt Lake. Downside to all of this is the roads are crowded, taxes are high, budget deficit is increasing, property values are flat. Upside is that the public schools (outside of the urban zones) are among the best in the nation, municipal services are excellent, and the infrastructure tends to be decent. One caveat is that if you have a choice, avoid the JCP&L (Division of Ohio-based First Energy Corp) power grid, and opt for something else — anything else. JCP&L customers tend to lose electric power frequently, and the utility has a very poor reputation for restoring service in a timely manner, often taking days and even weeks. Hard to believe in such a populous, modern state, but you’ve been warned. Add it all up, and as a skier you’ll easily give New Jersey an above-average grade as a home base.